While defeated, however, these states were not destroyed; if Hammurabi had a plan for welding them to Babylon he did not live long enough to see it through. Within a few years of his death, Elam and Assyria had withdrawn from Babylon's orbit and revolutions had started in all the conquered territories. The task of dealing with these troubles—and others—fell to Samsu-iluna. Though he campaigned tirelessly and seems to have won frequently, the king proved unable to stop the empire's unwinding. Through it all, however, he did manage to keep the core of his kingdom intact, and this allowed the city of Babylon to cement its position in history. 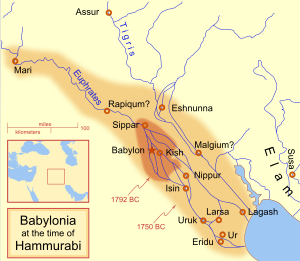 In the 9th year of Samsu-iluna's reign a man calling himself Rim-sin (known in the literature as Rim-sin II, and thought to perhaps be a nephew of the Rim-sin who opposed Hammurabi):48–49 raised a rebellion against Babylonian authority in Larsa which spread to include some 26 cities, among them Uruk, Ur, Isin and Kisurra in the south, and Eshnunna. :243:48–49:115 in the north. In the end, Samsu-iluna was left with a kingdom that was only fractionally larger than the one his father had started out with 50 years prior (but which did leave him mastery of the Euphrates up to and including the ruins of Mari and its dependencies). :115[Note 4] The status of Eshnunna is difficult to determine with any accuracy, and while it may have remained in Babylonian hands the city was exhausted and its political influence at an end. Samsu-iluna's campaigns might not have been solely responsible for the havoc wreaked upon Uruk and Ur, and his loss of Sumer might have been as much a calculated retreat as defeat. Reasons for this are hard to come by. Certainly the constant warfare cannot have helped matters, but Samsu-iluna appears to have campaigned just as hard in the north, and that region was thriving during the period. :115 The rise of Babylon marks a definite end to Sumerian cultural dominance of Mesopotamia and a shift to Akkadian for government and popular writing;:117 perhaps people who claimed cultural ties to the Sumerian past retrenched around the southerly cities which Iluna-ilu controlled. Several members of his dynasty took Sumerian names, and it appears they consciously strove to return to the region's Sumerian roots. :49–50 It is also possible that economic or environmental factors were involved; it is known that both Hammurabi and Rim-sin I had instituted policies which altered the economies of the region,:115 perhaps these proved unsustainable in the long-term. In the 9th year of his reign, Samsu-iluna turned back an invasion by a Kassite army. :243 This is the earliest known mention of the Kassites, who would go on to rule Babylonia after the collapse of the Amorite dynasty. Additionally, there is speculation:103 that Samsu-iluna instituted the Standard Babylonian calendar, possibly as a means of tying his empire more closely together. ↑ An inscription commemorates the defeat of “26 usurping kings”. ↑ This was in year 15 of his reign, possibly too late to have resulted from Rim-sin's rebellion. ↑ The actual dates are very uncertain, but they oscillate between the 18th and 29th year of Samsu-iluna's reign. ↑ Sources seem to agree that Mari remained in Babylonian hands, although a less recent, obscure, partial inscription from the end of Samsu-ilana's reign remarking on a “host of the Westland” is a possible reference to the loss even of Mari. ↑ 1.0 1.1 1.2 1.3 1.4 1.5 J. N. Postgate (1994). Early Mesopotamia: society and economy at the dawn of history, reprint edition. Routlidge Publishing. pp. 49–50, 75, 219. ISBN 0-415-11032-7. ↑ 2.0 2.1 2.2 2.3 2.4 2.5 2.6 2.7 2.8 2.9 Roux, Georges (1992). Ancient Iraq, Third Edition. London: Penguin Books. pp. 195–201, 242–243. ISBN 0-14-012523-X. ↑ 3.0 3.1 3.2 3.3 3.4 3.5 3.6 3.7 Cyril John Gadd (1965). Hammurabi and the end of his Dynasty, Volume 2. Cambridge University Press. pp. 48–49. ASIN B000XA193E. ↑ 4.0 4.1 4.2 4.3 4.4 4.5 4.6 Van de Mieroop, Marc (2006). A History of the Ancient Near East ca. 3000-323 BC, 2nd Edition. Malden, MA: Wiley-Blackwell. pp. 115, 117. ISBN 1-4051-4911-6. ↑ 5.0 5.1 5.2 5.3 Frayne, Douglas (1990). Old Babylonian period (2003-1595 BC). University of Toronto Press. pp. 374–377, 380–385. ISBN 0-8020-5873-6. ↑ D. D. Luckenbill (1926). Ancient Records of Assyria and Babylonia. Chicago. ↑ Schneider, Tammi J. (2011). An Introduction to Ancient Mesopotamian Religion. Grand Rapids, MI: William B. Eerdman's. p. 103. ISBN 978-0-8028-2959-7.